This particular song has lately been among my favorites. Well, but what could I write about the week that has just passed? Not much has happened. My life as it would rest for a while; it seems that way. Yet it is not so, not at all. There are some decisions I will have to make. There are some more inner things I will have to overcome. Think stuff over and so on. Perhaps I could say that I feel some strong storms raging within me... tearing me apart, striking me down. Even the most interesting outer event of last week was - that I was caught in a storm. Very real storm. Yep, the weather has turned stormy. Nice refreshment in this too hot and too heavy air. So, I was in the city centre when the storm burst out. When I headed to one pizza place, lightning and thunder was quite frightening. It felt as it would be striking very close, just above my head. As a fan of Nordic mythology (and as a devoted metal fan, hehe) I have a silver necklace with Thor's hammer Mjöllnir. Thor was Nordic god of thunder. Getting myself familiar with mythologies, mainly Greek, Norse and Finnish, I have already been thinking about this overall popularity of thunder gods. Or if I help with Wikipedia's words here. People of many cultures have praised a thunder god, a personification of the seemingly magical forces of thunder and lightning. Frequently, the thunder god would be the chief or king of the Gods e.g. Zeus in Greek mythology, or otherwise a close relation e.g. Thor in Norse mythology, son of Odin. Our Slavic thunder god, gromovnik, was Perun. The Finnish one is called Ukko, sometimes known as Perkele (huh). Well, Ukko's weapon is also a hammer called Ukonvasara (Ukko's Hammer), or an axe or a sword, by which he struck lightning. Ukko nowdays means an old man whereas ukkonen is - thunder. Today, I was watching again how black clowds gathered. The wind literally blew them over the sky; as they would fell over the forest nearby. The storm stroke again. So, I would ask all thunder gods to make my mind clear with their roaring voices. I would ask them to cool my heart with fresh cold rain... I would ask them to burn my doubts and fears within the fire of lightning, thus making another godess out of me... strong, cold and fearless (beautiful I am already). 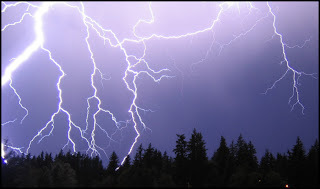 There really is divine power in thunderstorms. Meilläkin on ollut täällä Suomessa (Helsingin seuduilla) ukkosia parin viime päivän aikana. Viimeisin ukkoskuuro iski tänään ja kasteli minut aivan läpimäräksi :) Ukkoset ovat aivan mahtavia. Tänään osasin jopa nauttia salamoinnista, vaikka yleensä pelkäänkin ukkosta. Niin se oli. Luin siitä jo blogissasi. :) Ja oliko se viime tiistaina... en muista nyt, mutta viikon alussa se oli kuin luin Helsingin Sanomia netissä. Silloin luin myrskyistä ja näin myös kauniin kuvan salamasta Helsingissä.